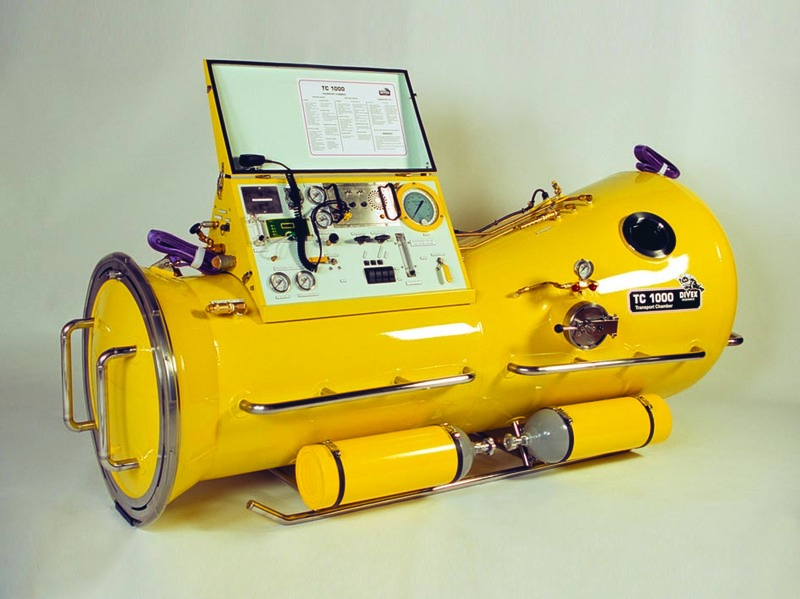 The lightweight, fully transportable, two-man TC1000 transport chamber provides for on-site recompression treatments and transport of divers under pressure. The two-man, stainless steel TC1000 transport chamber provides easily mobilised on-site recompression treatments and transport of divers under pressure to larger treatment chambers. With two occupants under pressure, it may be hand-carried by ten or twelve people and is easily transported by helicopter, small fixed-wing aircraft or light pick-up truck. An optional non-magnetic version, the TC1000 - MCM transport chamber, is also available for use aboard mine countermeasure vessels. View port diameter 150mm I.D.